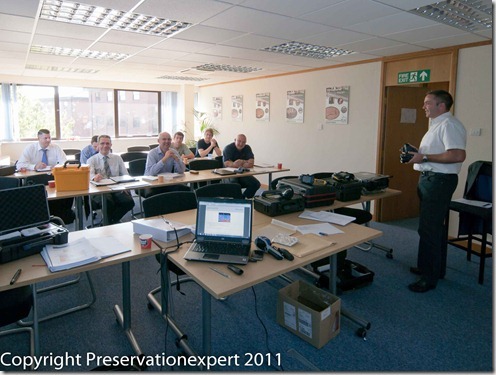 You are here: Home / Damp / Property Care Association – short course “Introduction to Building thermography”. Last week I was a paying guest at the PCA office in Huntingdon, for the above course. I get down there a lot these days, often just to keep my CPD up to date. This course is new though and I couldn’t miss it. 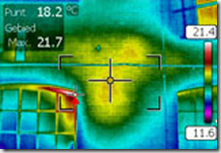 Thermal imaging has been beyond the reach of our industry due to cost of cameras, which not that long ago were in tens of thousands of pounds for a reasonably good model. In recent times that has changed and models for a few thousand pounds have the sensitivity and resolution needed for use in buildings. That said, nobody has been using it much for damp applications anyway, other than water leaks and the occasional drying company and flood remediation contractor; keen to prove or disprove that a building is wet. Whether we have another tool to help diagnose damp issues quickly and find problems, which otherwise may have escaped attention remains to be tested. Obvious areas are leaking cavity drain membranes in basements, leaking roofs and cold bridging issues, including blocked cavities and missing insulation. To get us all started we discussed heat transfer; convection, conduction and radiation. Quite basic school physics, but if you’re anything like me, those days are decades ago and a refresher is always welcome, especially as the best I could do was a grade 2 CSE in my physics exam! That dealt with, we were taken through the way cameras detect radiated energy and how this is represented. Crimson Industrial Vision brought along at least 6 different camera models to demonstrate, ranging from maybe just under a couple of thousand pounds through to over 20K. We used them all; even analysing each others images using Flir’s wireless data transfer, so we could view live images on cameras others were using, (I have to say that the nerd in me got quite giddy at this point). This being a PCA course we had a room full of people with very enquiring minds; there was lots of discussion, which really helped keep the course relevant to us and down to Earth. I was sat next to Les Sellers of Britannia Preservation, who’s been using thermal imaging for a while now. This was good because he was able to air some questions raised by his initial experiences using the technology on real sites. Lots of this was all knew to me, I thought Germanium was just an obscure element named so because the Clemens Winkler; the chemist who isolated it, was from Frieberg, Germany. Turns out that this semi-metal, separated on the periodic table by silicon and tin, is crucial to Flir – it’s transparent to radiation in the infra-red spectrum. The weird properties of elements eh? meanwhile, silicon, as glass, is totally obscure to IR, yet transparent to visible light – you couldn’t make this up. Crucially there are two ways we can use these units on site: obtaining qualitative readings, merely to find anomalies for further investigation or, quantitative; inputting emissivity and reflected temperature factors into the units for precise accuracy. The report writing section was mind blowing for me, as someone who is not familiar it, it really opened my eyes to the possibilities open to us. The images are captured with all the site data included in the thermogram, combine that with air temperature and dew points and you can then sit back at the office and dig deep into the image to fine tune the diagnosis and display every pixel at or under the dew point – fantastic. I can see myself playing with the parameters for hours, every night of the week if I’m not careful. I like my surveying toys as much as the next man. Playing with the kit was fun and I’m impressed by the functionality and application, particularly the software. I think that to get the best out of this technology it needs parallel investment in training, otherwise it could be an expensive and unused white elephant or worse still, get the unwary into deep trouble. Practise is important too, so buying a camera is not only a financial decision; it must be used at every opportunity and the findings cross-checked by other means before I’d feel comfortable offering a service to my clients. On balance, I would and will be buying a camera in the near future. However, I have no illusions that the financial investment will be repaid anytime soon. I prefer to see it as a refinement of my surveying practice and it will add to that. If you are new to this technology this course is perfect; basic enough for newbies, yet well thought out and presented, with sufficient flexibility, allowing those already possessing a basic knowledge, to prize more detail from Flir and Crimson Industrial Vision’s very capable team. A big thanks to The Property Care Association for having the foresight to put this on for us, also Paul Sacker of Crimson Industrial Vision and Flir Systems, for their time and expertise (and for putting up with my dumb questions).